The Turtle is one of our most popular fins for drysuit divers because of the large foot pocket and weighted characteristics. Earn up to 180 Points. The Turtle is one of our most popular fins for drysuit divers because of the large foot pocket and weighted characteristics. 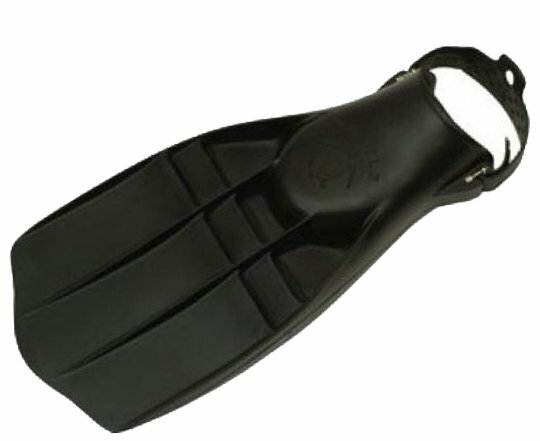 It is a solid fin, made of compression moulded rubber which provides excellent power for the diver regardless of finning technique. Broad, stiff edges allow for a forceful frogkick and backwards kick along with a standard flutter kick. The relatively short, broad fins allow for efficient propulsion through confined areas like caves and wrecks. The fins are extremely responsive and maneuverable. The weight of the Turtle fins (approximately 2lbs negative in salt water) helps drysuit divers trim out – if you find you have slightly positively buoyant feet in a drysuit, Turtles may help you get them back under control. With its construction the Turtle provides exceptional speed with minimal effort. We will refund or exchange an item within 14 days of you receiving it. Original packaging, tags and literature must accompany returned products and all products and packaging must be in new condition. When an item is being exchanged due to sizing reasons, we will provide free regular or expedited shipping on a one-time exchange within 14 days of receiving original purchase for sizing purposes. Additional exchanges will be charged shipping fees. Returns will be charged shipping fees. Please review our exchange and refund policy page for complete details. Become a member and collect reward points redeemable for discounts on future purchases.